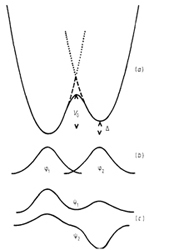 By using the tunneling-states model the temperature dependence of the resonance frequency of superconducting resonators in the low (ωτ » 1) and high (ωτ « 1) temperatures limits is investigated. Resonant, relaxation mechanism of phonon absorption by two-level states and complex conductivity are considered to determine the temperature behavior of the resonance frequency shift. Depending on the temperature range the behaviors of resonance frequency is determined by these effects. In the low temperature limit the relaxation and complex conductivity parts of the frequency change is much lower than the resonant part.